On October 26, Nash Community College hosted the Eastern Coastal Region Fall Coastal Mini-Region Nurse Aide Training (NAT) meeting. Representatives from facilities and institutions in Wilson, Kinston, Goldsboro, Halifax, and Wilson joined Dr. Teressa Banks for a presentation at the college. Banks works with the Nurse Aide Registry Administration of the North Carolina Department of Human Health Services (DHHS). The Department is the regulatory agency that oversees the Nurse Aide Level I (NAI) program in North Carolina. Semi-annually, DHHS holds a regional meeting with program coordinators, administrators, and others involved with NAI to discuss any changes in the guidelines for the program and to address how to best serve local citizens. The meetings give instructors the opportunity to network and share ideas on effective teaching strategies and techniques that apply specifically to teaching hands-on patient care to students, many of whom are making their initial entry into the field of healthcare. 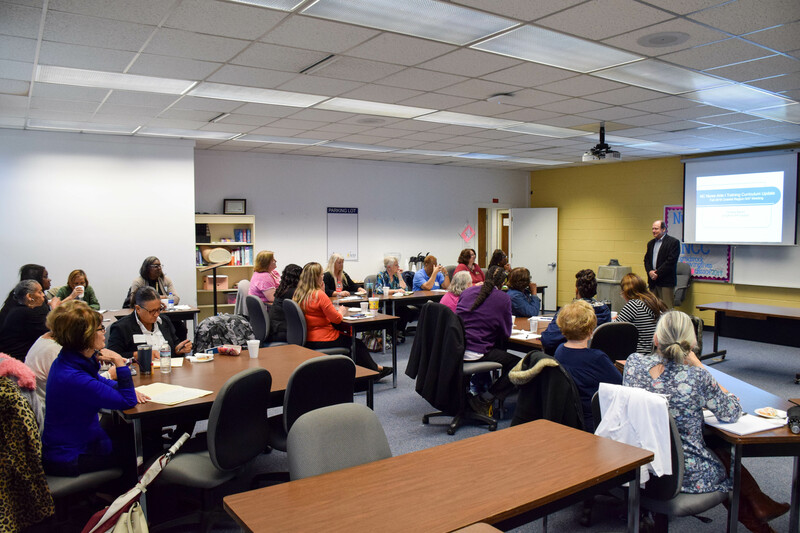 Pictured: Nash Community College President Dr. Bill Carver welcomed Nurse Aide instructors from around the region during the Fall Coastal Mini-Region Nurse Aide Training (NAT) meeting held on NCC’s campus.